This is part two of an interview with Dr. Gary Genard on his recently released book Fearless Speaking. To read part one go here. In the next two weeks I will be posting a review of the book up on the blog along with hosting a giveaway for a free copy of the book to one of my readers. Q: What are some of the techniques covered in this book? GG: The techniques in Fearless Speaking encompass a range of performance skills. By mastering proper breathing, for example, anyone can eliminate the short breaths and shaky voice that come from nervousness and anxiety. Another technique involves using body language to create an authoritative speaking style. The book also covers relaxation and focus, how to use gestures, vocal expressiveness, starting and ending strongly, achieving mindfulness, and many other powerful approaches to speaking effectively. All of the exercises are designed to draw upon your personal experiences with public speaking. That's a powerful tool in itself for transforming one's thinking and becoming a more dynamic speaker. By developing new habits, your skills will always be at your fingertips without you having to think about them. Q: Who is Fearless Speaking meant to benefit? GG: This book is for anyone and I really mean that literally - who has jitters, nervousness, anxiety, or self-doubts concerning their speaking skills. Some people only get butterflies, of course, while others suffer full-blown panic attacks. This book is for any one of those speakers. Fearless Speaking really provides a practical toolbox of hands-on skills that can be applied in any speaking situation from interpersonal communications to presentations to formal speeches. It empowers people to focus on the task at hand so they can speak with confidence, comfort, and control. In fact, the book could have been title "Speak with Confidence." Learning how to speak fearlessly allows you to regain your momentum, pursue opportunities you've been avoiding, and reconnect with the world personally and professionally. Q: Do the techniques in your Fearless Speaking System take a long time to master? GG: Not at all. In facts, that's one of the beauties of the book. Fearless Speaking can help you overcome your fear of speaking in as little as twelve days. That's one chapter per day. If you take that approach and do all of the recommended exercises, it's a convenient and easy way to eliminate your fear of public speaking quickly. Best of all, it's based on your own personal experiences, which is the concept behind the Fearless Speaking System. The subtitle says that this book can change your life, and I really believe that. Q: Can it help with all type of speaking opportunities? GG: Absolutely! Any speaking application can benefit from the techniques in Fearless Speaking. Whether it's situational anxiety that comes from talking to your boss, to high-profile appearances such as delivering a major address, appearing on television, or being interviewed by The New York Time, the Fearless Speaking System will help you stay poised and professional. After all, giving a toast at a wedding or impressing someone you're on a date with requires you to come across honestly and credibly, while being at your very best! Q: Does your method work for groups as well as individuals? GG: All of the techniques featured in Fearless Speaking work just as well for groups as for individuals. The key is for each person to apply the approaches I discuss in terms of their own needs and experiences. The group approach, of course, provides the benefit of practicing before a built-in audience. For instance, companies can host Fearless Speaking Lunch-and-Learns once a week or once a month. 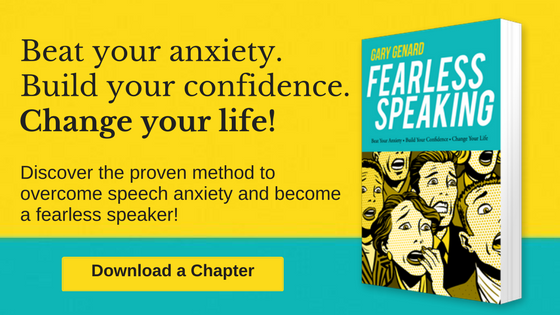 Participants can go through the exercises in the book, using Fearless Speaking as a workbook. At the same time, they'll be gaining valuable feedback and support from their colleagues on a regular basis. GG: None whatsoever. Fearless Speaking is a one-stop-shopping approach to overcoming fear of public speaking. The book gives you my complete fear reduction system, the very same techniques I use with my private clients in Boston. There are no other costs involved in the Fearless Speaking System. If anyone who reads the book would like to arrange for one-on-one sessions with me, they are welcome to arrange for an in-person appointment by contacting The Genard Method at www.GenardMethod.com. Q: How can I get the book and learn more?